For some of the best views of Myrtle Beach, take a ride on the second tallest ferris wheel ride in North America on the Myrtle Beach Boardwalk. On the Myrtle Beach SkyWheel, guests soar 200 feet above the ocean, offering beautiful views and wonderful photo opportunities of the Grand Strand oceanfront. 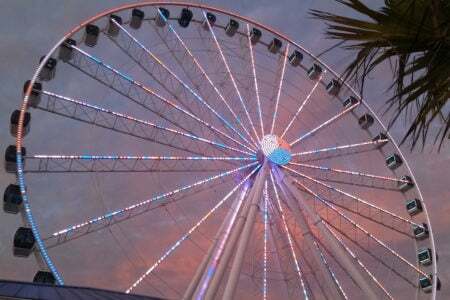 All 42 gondolas on the Myrtle Beach SkyWheel are climate controlled, ensuring comfort for all its guests. Catch a ride in the morning and afternoon to see the beach and boardwalk at its busiest, or grab a flight at night when the entire Skywheel illuminates with an assortment of animated colors. Tickets are $13 for ages 12 and up and $9 for ages 3-11. VIP tickets are also available and start at $50. VIP flights include a ride in a special cabin with leather seats and a glass floor. The gondola only seats four people and lets riders enjoy a double ride and receive a free t-shirt and SkyWheel lanyard. For more information, please call (843)-839-9200.